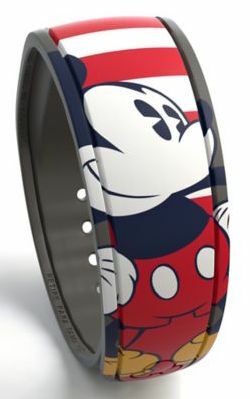 The Americana Mickey Limited Released MagicBand has gotten an updated design! 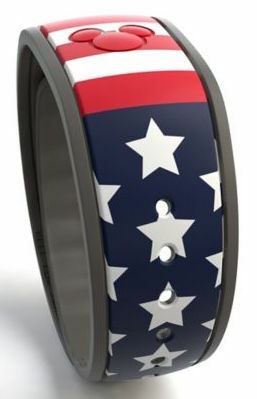 Released today in the Shop Disney Parks mobile app and in Walt Disney World to prepare for Independence Day in the United States on the 4th of July, this band now features an American flag design on the back rather than just white stars. The band cost is $27.99 and doesn’t do any special effects lights/sounds at touch points. 3 Responses to "Americana Mickey Limited Release MagicBand updated with new design for 2016"
Except for the red Mickey on top, one could argue that that is a white band with red and blue on it rather than a red band w/ white and blue on it. Either way, I like this one even more. No, It’s a red band because the mickey sensor on top is red. Therefore the band has a red base color!